Many thanks to those who have PMd me over the last few days. This site seems to have most of the things I want (including a working search function). Interestingly a user can block another user and never see posts from them again. I can think of a few punning types I could use this for! If you can't be bothered to register (I may can the whole project) then there's a user test1 password test1 you can play with. Have a look at the user profile options, they're more comprehensive than here. This is a knocked together late at night site, so you may find some holes in it. Edited 1 time(s). Last edit at 14/12/2018 09:48 by DOK.. Seems good to me Kim. Looks nice and simple. No problems loading on Android on mobile setting or Desktop view. Like the option for seeing unread posts. And no annoying adverts popping up or taking over a large proportion of the screen. Presumably there is a cost for this. From reading - there are monthly costs for keeping it ad-free and also using more than 250mb of storage. Is this a different pricing system to the current board? Also, is there any possibility of migrating the current board - or would the only option be to let the current board cease to exist by not posting any articles? I can't see us running over storage on new board, so I would hope it is free. If it gets an issue we'll move some of the storage elsewhere and just link to it. Actually, sportnetwork pay the site owners to run the site, it's about £100ish a year. Currently that goes to prof and I believe he uses it for the odd beer for QUINSSA, odd expenses like the ComeAllWithin domain and so on. We'd lose that income but frankly for a better site I'd pay it myself. It does use advertising, but that seems to consist of about an inch of the page at the top. Nowhere near as intrusive as the current site. I can't see how we can simply migrate the current board. I'll ask the SN team, but I doubt they have any reason to be helpful. If there's anything particular you want saved/replicated I'm sure we can do it manually. Looks good to me, letâ€™s do it!!!! I'm keen if you are. It looks good and does indeed have slight retro feel to it. I'm half expecting the mighty Julian to start posting again. I am possibly the least techie person in south west London so I'm disenfranchised when it comes to saying yes or no, but I'd be happy with it. I've never managed to post a photo on here but have managed it on the new one. Hoorah! I've had this site set up for a couple of years and it offers a more customised forum, more than happy for you to use it or I can set up one like that. Edited 1 time(s). Last edit at 10/06/2018 16:16 by 23Shark. Yes, but part of the retro feel is because it's a clean display. SportNetwork are close to extracting the Michael with the way they do adverts while you are trying to read the message board. I have an adblocker, but when I have to live without it (like at work) the experience is pretty terrible. Hope we can still run a Prediction League. Well we ought to be able to find a rugby prediction league that isn't as obscure as the SportNetwork one. Fancy that being your task for the summer BB ? 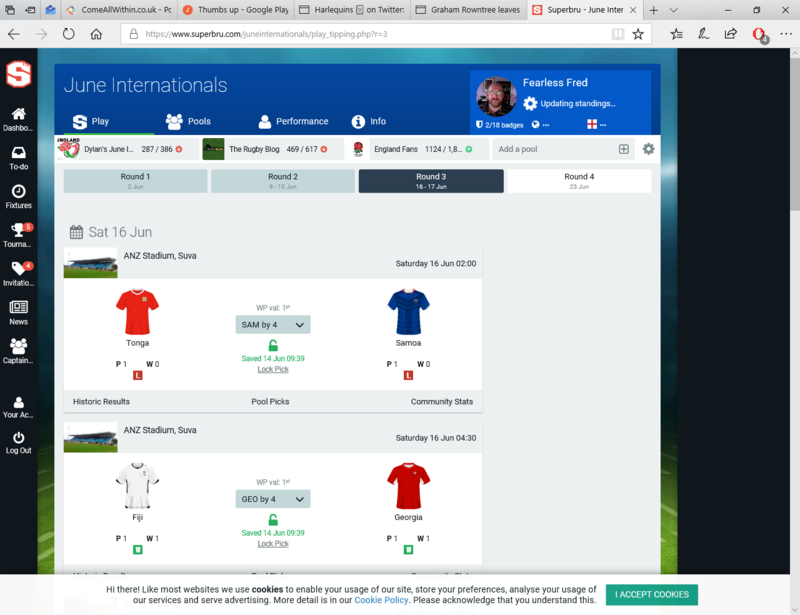 If you set up a wordpress site then it's possible to run your own as there's a prediction league software, it's easily customisable. 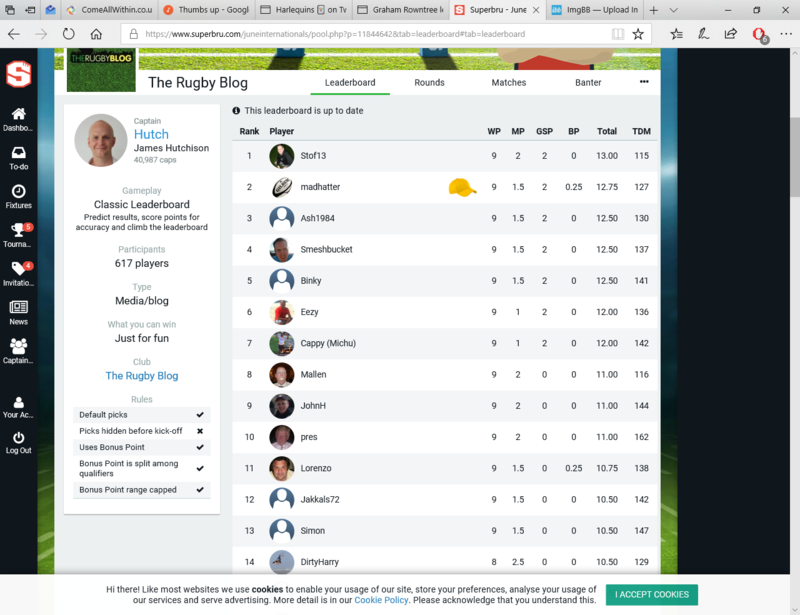 Re the Prediction league, can I make a case again for using the excellent Superbru site? We can set up our own "ComeAllWithin" pool for the Premiership (and any other competition like the European cups, Internationals, Super15, Top14, Pro14, whatever. It's really easy to use, free, and works a treat. I've been playing for fun on there for a number of years. You get timely reminders if you haven't made that weeks picks, and gives you a live leader board at all times. Sounds good to me! And you're volunteering to run this? I can easily put up a link (here or new board) if you give it to me. OK - that would be good. A mickey mouse intro to how to use it would be good. Okay, now for a micky mouse version! First, you need to create an ID on their site, so you can log on to play. I suggest using the same screen name as you use here. When I've set up the pool (once the Premiership new season is loaded onto their system), There'll be a link and a password t join the pool, which we can post here. What's good is that you're not limited to one pool. If there's others for the same competition that you'd like to join, you can join them as well (up to 10 per competition I believe). Ones I've joined include the one run by the guys behind The Rugby Blog, for example. Simply pick which team is going to win, and what the margin will be using the pulldown box. You can see their previous results below the teams, and if you click on, say, the red L below Samoa, it'll show you who beat them, by how much, and whether it was a home or away game. The history shows up to the last 8 games, typically. Make your picks for all the games in a round & the job's done! Don't worry about "locking" picks. All that does is allow you to see what everyone else in your pool has picked prior to the game itself. After the games are done, you get awarded points. Pick the right team to win, and you get one Point for the Win. Predict the score margin to within 5 points, and you get an extra half point. You can even get a half point for the margin in a close game where you picked the wrong winner(say we beat Saints by 2 and you predict Saints by 2). Get all the winners in a single round & you get a Grand Slam point as well. Finally, within a pool if you make the most accurate pick for a game out of the pool players, you get a Bonus point. If two people have made the same most accurate pick, the bonus point is shared, half each, 3 players 1/3rd each, 4 or more players 0.25pts each. All the calculation is done by the site, no need for anyone to press any buttons on a calculator etc. At any time you can look at the Leaderboard to see where everyone stands in a pool. Rankings are first by the points you've accumulated. If two players have the same total points score, then the site will rank you by TDM (Total Difference Margin) which is a total of how far away from the actual points difference your picks were across all the games you've picked. If you miss a pick, the system will allocate a "Default Pick for you (up to a limit of 5 Default Picks). Edited 2 time(s). Last edit at 15/06/2018 06:59 by Fearless Fred. Sounds good! Better than the Sportnetwork one. Can you identify whether the same person is using multiple identities on the new forum, or has that gone with the dominance of mobile technology? I think that was impossible prior to mobile technology. If people use the same IP address, then obviously can identify them. The board also recognises duplicate email addresses for people, and won't allow it. But obviously there are simple ways round both those. I do this one as well but the one I do is for all premiership games, can it be modified for one team only. Slight disadvantage for me is that you do not predict the score but only the result and the margin of the win. Being a bit of a Luddite I know but I enjoy the current format more. Well, sort it out between yourselves or tell me you want two links, I don't mind but I assume the competition is in beating your fellow Harlequins fans. OK - I think I have proved that I can replicate just about anything we were doing here on the sportnetwork board. Please go have a look and see if there's anything you can't live without. There are a couple of options I haven't enabled, such as avatars and user polls but I think we'll get the thing going then worry about the odd things later. "When are we going?" I hear you ask. Well, I want to cause minimum disruption necessary - so was thinking of a few days after the third England test when the euphoria of winning has died down - does that seem reasonable? Was going to suggest we switch over for about a week and then see whether we're still happy with the new set up. I used to be indecisive too but now I'm not so sure. Database Administrator - Always have a backup, always have a roll back plan. That way you won't need them. I cannot manage to post a picture on either, what is the trick? Do you plan to leave the two running in parallel for some time, as despite there being a couple of threads running for weeks now, I guess loads of posters will know nothing about the proposed change? Yes - will try and make it as obvious as possible that we moved, Probably just jump on every new thread and say"Why not discuss this on the new board?" - that was kind of why I wanted to wait until third test done and we would be running with limited new threads. But yes, will leave the old one (this one) going for a while. But not intending to run two boards as such. Weird isn't it? We have running water, electricity and talking pictures these days..